As many of my friends know, the Great Vigil of Easter is my favorite church service. It is, of course, the highlight of the church year. The resurrection is clearly the most important event celebrated by the Christian church. 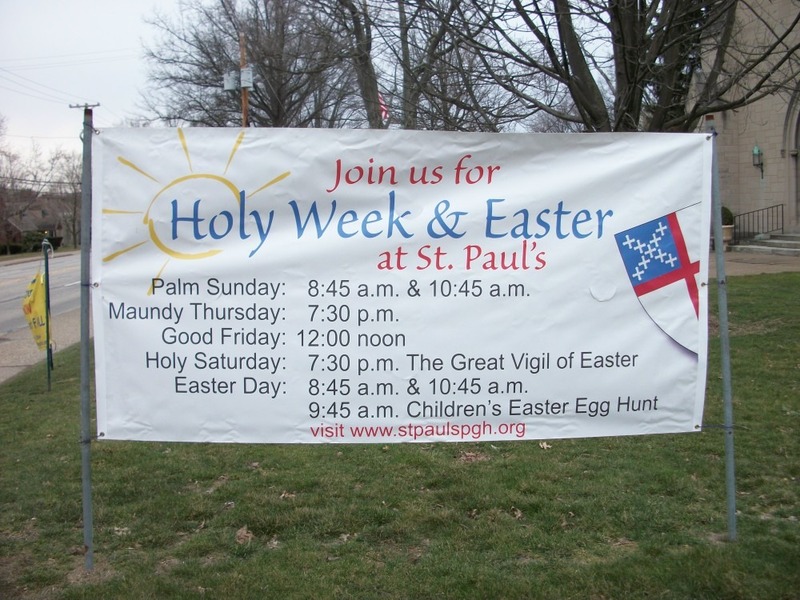 Significantly, The Episcopal Church has no special Easter Sunday liturgy, but there is a unique liturgy for the first Eucharist of Easter, which is celebrated at the Easter Vigil. I first attended an Easter Vigil at St. Paul’s, and I was very impressed. (See “An Easter Vigil Memoir.”) As a long-time member of the Worship Commission and Audio-Visual Coördinator, I became the keeper of the corporate memory of how we orchestrated the service. Over the years, I felt that we had gradually made a fine service even better, nearly perfect even. The only Vigil I have ever attended that came close to rivaling the St. Paul’s service in its heyday was that of Washington National Cathedral, and that only because it is exciting to be walking from one venue to another in a huge, dark building. Under Lou Hays, services generally, and the Easter Vigil particularly, were simplified. I resigned as Audio-Viosual Coördinator, as it was clear that the new rector had little that he wanted me to do. I was so disappointed in the first Vigil after he arrived—I was in tears at its conclusion—that I began attending Vigils elsewhere in the diocese. 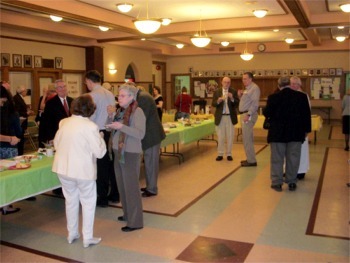 (Several local Episcopal churches do a good job with the resources available to them. I particularly recommend the Vigil at Church of the Redeemer, in Squirrel Hill.) This year, I decided to have another look at what St. Paul’s was doing. In all honesty, I have to say that St. Paul’s put on a perfectly adequate service this year, but it cannot compare to the glory of the past. Let me explain. Starting time for the service actually matters. At 7:30, the church interior was reasonably dark, but the first fire of Easter was lit outside the front doors of the church, an action that would have been more dramatic had it been dark outside. (Redeemer actually lights a bonfire outside the church; worshipers light their candles and then go inside. It is striking in the dark.) I am actually pleased that the lighting of the fire and the candles of worshipers now takes place outside St. Paul’s, but much of the drama is lost by doing it in broad daylight. Another change I noted immediately was the lack of pew candles. Not only do the pew candles enhance the atmosphere of the church, but they actually provide useful illumination. (More on this presently.) Over the years, we had devised a procedure for lighting the pew candles so that the candlelight began at the back of the nave and slowly moved forward with the Pascal Candle. It was an impressive sight. What was done last night was that the Pascal Candle was carried up the center aisle as choir members moved in parallel up the side aisles. Worshipers followed. It was not ineffective. Doug had warned the choir that we would be singing by candlelight. That was adequate in the chancel. I cannot say what visibility of the service booklet was in the nave. (The service booklet was a good innovation, by the way, though I don’t know why we did not use color on the cover, as we regularly do for the 8:45 service.) Because the track lights in the side aisles were on low and people in the pews did have their candles, I suspect that most people could read the booklet adequately, though pew candles would have helped. I was surprised, when it came time to sing the first hymn. Rich Creehan increased the lighting suddenly. (If that was to be done at all, a delay should have been used.) Clearly, he and Doug were not on the same page. When it happened, I uttered an epithet that, mercifully, I do not remember. The chancel was unnecessarily bright; the choir could easily have sung by candlelight. The nave lighting was also increased, but, as best as I could tell, not so dramatically. The lighting change was jarring and gratuitous, rather than helpful. It was something we had carefully avoided in the past. From the narthex, someone knocks loudly at the door. At this point, the lights are instantly raised to their full intensity and music, including trumpets, is heard. We may want to encourage worshipers to bring their own bells The Gloria follows an organ and brass fanfare. As the fanfare is played, a second procession comes up the center aisle with clergy fully vested. Of this, only the fanfare has survived, and people have indeed been invited to bring their own bells. Last night’s bulletin mistakenly listed a Johann Christoph Pezel fanfare. In the past, I think Doug has used his own fanfare for organ and brass, and it has been marvelous. What was used last night, however, was Aaron Copland’s “Fanfare for the Common Man.” This was wrong on two fronts. First, we are supposed to be celebrating Jesus’ resurrection, not the “common man.” Perhaps more importantly, however, music, particularly instrumental music, is generally used liturgically to cover movement. Lacking the second procession, there was no movement to cover, and everyone was left standing simply waiting for the fanfare to end. There is not much more to be said about the service, as what followed was simply your basic Eucharist with Renewal of Baptismal Vows. (I’m always disappointed when there are no baptisms at the Easter Vigil, but one can do only so much about that. I know that Lou asked if anyone wanted someone baptized at the service.) It is perhaps worth noting that the stage directions Lou insists on giving were more irritating than usual, at least for people used to the 10:45 service, since the service bulletin made crystal clear the sequence of events in the liturgy. Of course, the service was followed by our usual Agape Feast in the undercroft, and I think it fair to say that it was a very pleasant affair with food and drink both pleasing and adequate. Epilogue. A number of years ago, our interim—now deceased—Michael Randolph, delivered John Chrysostom’s Easter sermon (from about 400 CE) at the Easter Vigil. That sermon is joyful and mercifully brief, and Michael, who was really an actor at heart, delivered it with panache. For several years, I tried to convince whoever was preaching at the Vigil to use that sermon, but I was never successful. Michelle Boomgaard gave a sermon that was good enough, but that of the fourth-century Archbishop of Constantinople is hard to beat. Read it for yourself and see if you don’t agree.